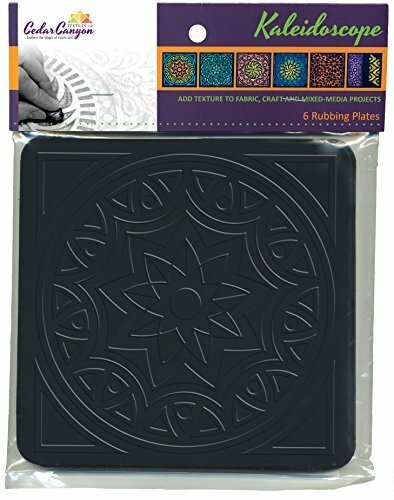 Kaleidoscope Rubbing Plates are a set of black plastic textured material that can be used to transfer designs to fabric. You can also use them for paper art, collage, quilting, polymer clay and more. Be sure to try making rubbings from both sides because sometimes the back is more interesting than the front. This set of six includes four circular designs, which include corner elements that can easily be trimmed away for those who prefer circular elements. The fifth plate is a star-burst pattern that makes a perfect background, and the sixth plate has two separate border or accent motifs. Each plate is approximately 7 1/4 inches square. Manufacturer: Cedar Canyon Textiles, Inc. Publisher: Cedar Canyon Textiles, Inc. Studio: Cedar Canyon Textiles, Inc. If you have any questions about this product by Cedar Canyon Textiles, contact us by completing and submitting the form below. If you are looking for a specif part number, please include it with your message.